things from ordinary plastic, paper and bottles. But I've been a "think outside the box" kind of person my whole life. Valentine's day coming up. A thrifty little craft idea that is practically free! the circles on the sides. "LOVE" with tiny dots forming the letters. 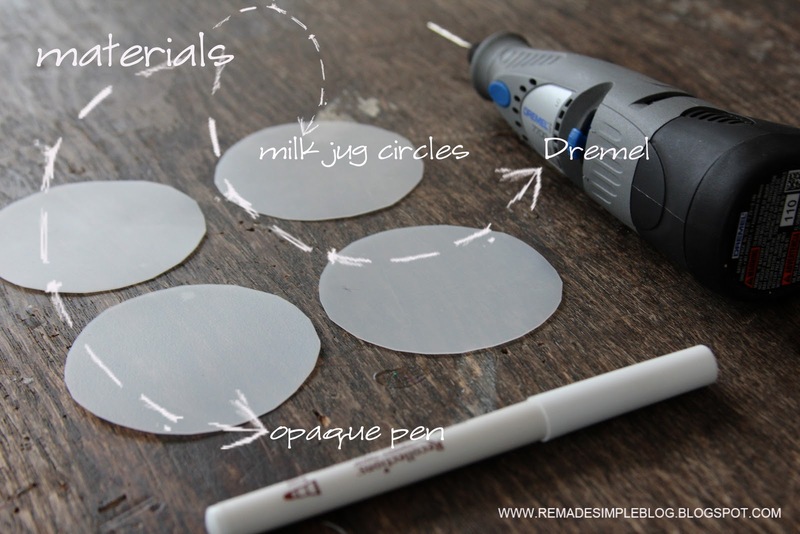 the Dremel works to make a perfect circle). each hole, then used a longer piece to string them all together. Look how pretty they look hanging in a window! All from a humble milk jug. (And not being a fan of red or pink, I love how simple the white looks with the twine). 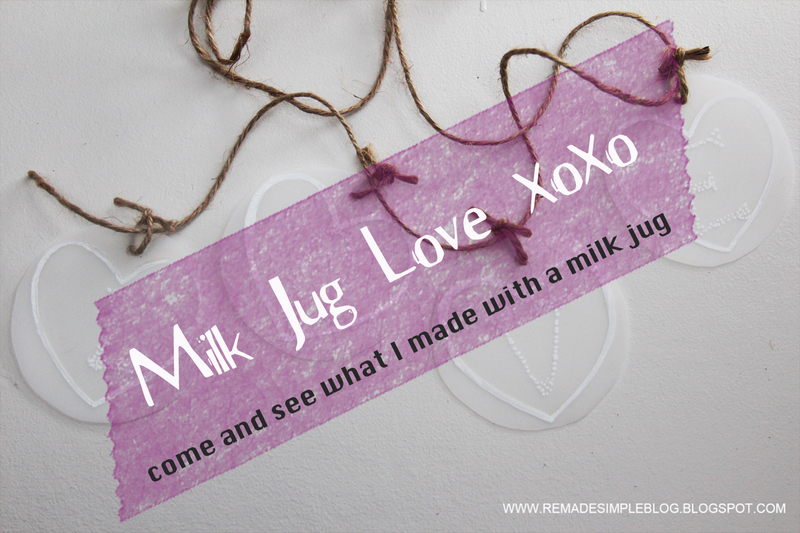 This is just the beginning of my milk jug love--I have more ideas up my sleeve that I will be experimenting with soon. I've had so much fun playing with the trash! I hope you'll come back and see what I come up with next. 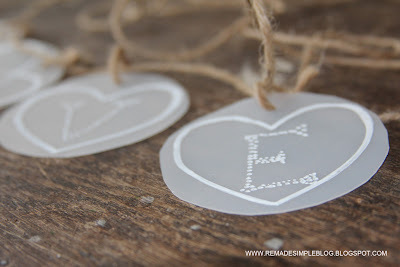 Oh, and I'll be showing you more creative, simple, and thrifty Valentine's ideas, too. 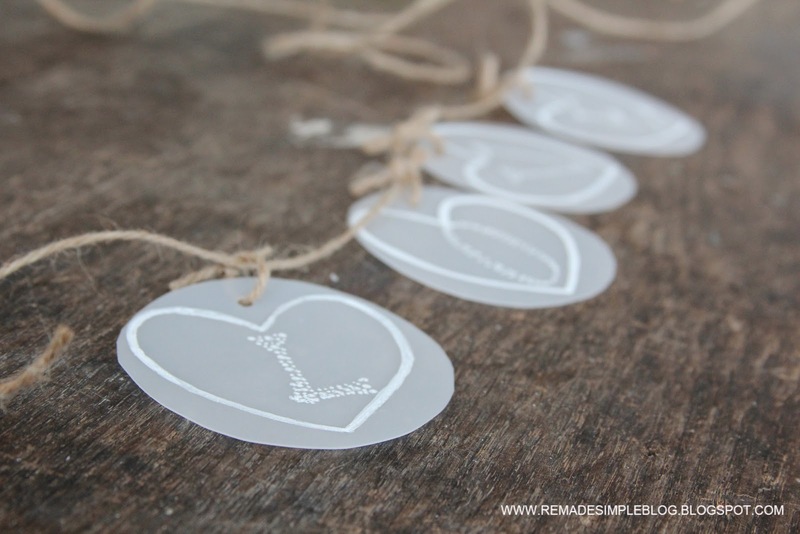 Stay tuned, feel free to snoop around some more , and thanks for visiting ReMadeSimple! Love the idea! Super sweet. I posted today about a banner too!! You and I are very similar! Right down to our projects! Thanks so much banners/garlands are fun for any holiday...great minds think alike! Wow! I love this! 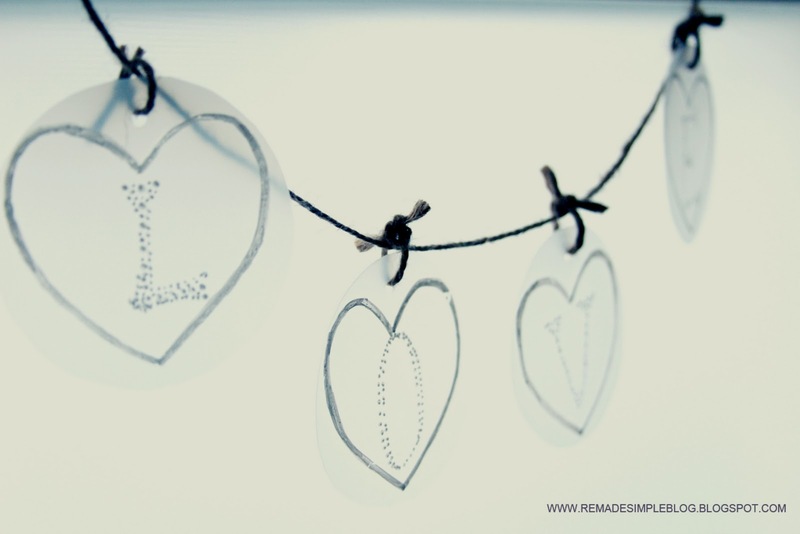 As a beginner to repurposing/crafts, I love how really simple you made this seem. I can't wait to try this one as I love almost anything with twine. Also can't wait to buy my (own) first actual tool lol I am day dreaming already about what I can use a dremel to make! Thank you and can't wait for your next post! What a great idea! I love it! I am gonna try this! Susan thank you! It has been really fun finding different ways to repurpose things you would usually trash or recycle. I agree - the white is so elegant and pretty! Such a cute idea, love it! I love it! I'm so impressed by your creativity. This is so pretty and I love the natural touch with the twine. Thanks, Emily! I love using natural and simple white :) And thanks for hosting! How fun!! I love your creativity. I would love it if you would share it at our sharing party at http://craftymomsshare.blogspot.com/2012/01/sharing-saturday-3.html. Thank you!! GREAT idea! I love that you're reusing trash! How cute is this idea! I'm so glad you stopped by my place...thanks for the encouraging comment! You're welcome-and thanks for stopping by too! Pinned...So cute! Come share at my FIRST link party! I better hurry and finish the milk I have in my fridge! I really love this idea. So much so that I featured it as part of my link party wrap up and features! 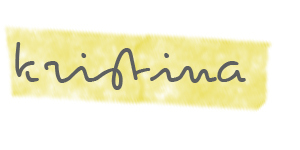 Feel free to grab a featured button from my sidebar if you like. Thanks for your support! I will stop by to see and grab a button! This is fantastic! There are so many things that you could do with this idea! Thanks for sharing at my party! I agree-endless ideas-I can't wait to share more milk jug love ideas--thanks for the kind words! Hi Aimee! Thanks for hosting-I did register for the giveaway-I would love to win one!! Thank you so much! I stopped by to take a peek at the feature-I appreciate your support! 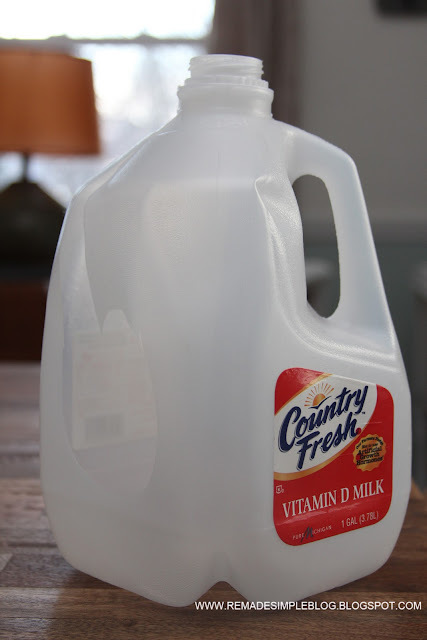 perfect re-use of milk jugs!!! This is just too cute! thanks so much for linking it up! Super cute milk jug ideas on your blog! I'm wondering how large the circles you cut are? You can also use your dremel to carve and scratch out lines and shapes into the plastic, rather than using a pen. 5 Free Facebook Timeline Headers! Baked to Perfection the Oven Fries Experiment! 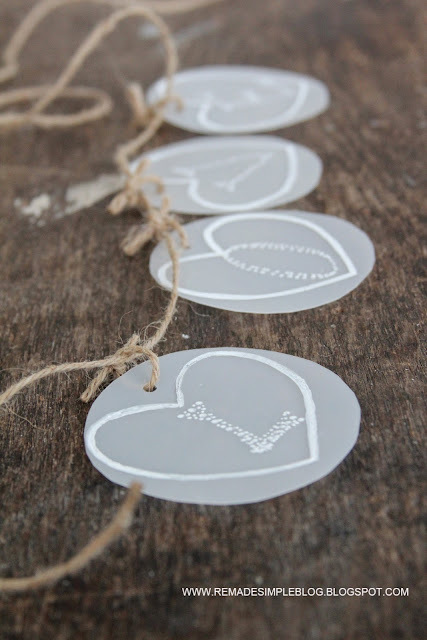 Make Your Own Scratch-Off Valentine's Day Cards!